This article is about the actor. For the High Sheriff, see Anthony Andrews (High Sheriff of Rutland). For the academic, see Antony Andrewes. Anthony Colin Gerald Andrews (born 12 January 1948) is an English actor best known for his role as Lord Sebastian Flyte in the 1981 ITV miniseries Brideshead Revisited (1981). He is also known for playing the title roles in Ivanhoe, Operation Daybreak and The Scarlet Pimpernel, and for portraying Prime Minister Stanley Baldwin in The King's Speech (2010). For his performance in Brideshead Revisited Andrews won a Golden Globe and BAFTA TV Award, as well as being nominated for an Emmy. Andrews was born in London, the son of Geraldine Agnes (née Cooper), a dancer, and Stanley Thomas Andrews, an arranger and conductor for the BBC. He grew up in the North Finchley district of London. At the age of eight he undertook dancing lessons, making his stage debut as the White Rabbit in a stage adaptation of Lewis Carroll's Alice in Wonderland. After a series of short term "fill-in" jobs that included catering, farming and journalism, he secured a position at the Chichester Theatre where he worked as an assistant stage manager and later as a stand-in producer. He auditioned in 1968 for a production of Alan Bennett's new play, Forty Years On, which featured John Gielgud as the headmaster of a British public school during the First World War period. Andrews was cast as Skinner, one of twenty schoolboys. In 1974 he played Lord Robert, Marquis of Stockbridge in the TV series Upstairs, Downstairs. In 1975 he had a leading role in the Spanish film Las adolescentes (The Adolescents), opposite Koo Stark. In June 1977, he was cast in the role of Bodie in the ITV series The Professionals. However, after three days of filming, the creator and producer Brian Clemens felt that the chemistry between Andrews and Martin Shaw (Doyle) did not work and that "the pair did not have the required undercurrent of menace to carry off the concept". Lewis Collins replaced Andrews in the part. Following that, in 1979, Andrews was the main star of the ITV television series Danger UXB, in which he played a British bomb disposal officer in the London Blitz. The series first aired in the United Kingdom in 1979 on the ITV network. His subsequent work includes the leading role of Lord Sebastian Flyte in Brideshead Revisited. In 1982, he won a Golden Globe and BAFTA TV Award for his performance and was nominated for an Emmy Award. In the United States, Andrews is best known for his portrayal of the titular character in Ivanhoe as well as that of Sir Percy Blakeney in the 1982 film The Scarlet Pimpernel. He played Professor Higgins in a stage version of My Fair Lady (2001), and Count Fosco in Andrew Lloyd Webber's The Woman in White. He was the narrator for a 21st Anniversary BBC Radio 2 special broadcast of Cameron Mackintosh's musical Les Misérables, sung by the then West End cast at the Mermaid Theatre in London on Sunday 8 October 2006. Andrews appeared as Prime Minister Stanley Baldwin in the 2010 film The King's Speech, for which he won a SAG Award along with Helena Bonham Carter, Jennifer Ehle, Colin Firth, Michael Gambon, Derek Jacobi, Guy Pearce, Geoffrey Rush and Timothy Spall. Andrews survived a case of water intoxication in 2003. The condition, known as hyponatraemia, is caused by the dilution of sodium in the body. It has similar symptoms to dehydration, such as headaches, nausea and cramps. Whilst performing as Henry Higgins in My Fair Lady, Andrews would consume up to eight litres of water a day. He lost consciousness and spent three days in intensive care. He married Georgina Simpson of the Simpsons of Piccadilly department store family. Their daughter Amy is a god-daughter of Princess Anne, The Princess Royal. 1972 Thirty-Minute Theatre Michael Warren / Vernon Warren Episode "The Judge's Wife"
1976–1977 Play of the Month Various characters In "French Without Tears", "London Assurance", and "The Country Wife"
1977 ITV Sunday Night Drama Harry Episode "A Superstition"
1984 Play for Today John Loomis Episode "Z for Zachariah"
1988 American Playhouse Johnnie Aysgarth Episode "Suspicion"
1989 Nightmare Classics Dr. Jekyll / Mr. Hyde Episode "The Strange Case of Dr. Jekyll and Mr. Hyde"
1996 Tales from the Crypt Jonathan Episode "About Face"
2004 Rosemary & Thyme Richard Oakley Episode "The Invisible Worm"
Count Fosco in The Woman in White. Professor Henry Higgins in My Fair Lady. Seasons with The New Shakespeare Company and Chichester Festival Theatre. W. Somerset Maugham's The Letter at Wyndham's Theatre, London (2007). Oscar in premiere of Bully Boy at the Nuffield Theatre, Southampton (2011). Coming In To Land at the National Theatre, London. ^ a b "Anthony Colin Andrews Biography (1948-)". Filmreference.com. 2011. Retrieved 16 January 2011. ^ "Debut : Anthony Andrews". The Independent. London, UK. 25 April 2001. ^ "Obituary :Lewis Collins". The Daily Telegraph. London, UK: TMG. 28 November 2013. Retrieved 25 February 2016. 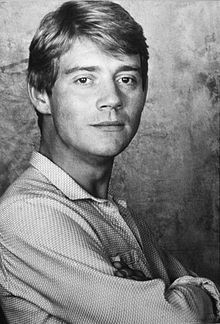 ^ "Anthony Andrews". flyrope.com. Archived from the original on 11 March 2007. Retrieved 11 October 2006. ^ "Actor Andrews in water overdose". BBC News. London: BBC. 4 July 2003. Retrieved 25 February 2016. ^ Demoskoff, Yvonne (2009). "Godchildren of HRH The Princess Royal". Yvonne's Royalty Home Page. Retrieved 25 February 2016. This page was last edited on 10 March 2019, at 04:45 (UTC).